Tomato Season is over for Northdixie Designs for this year after I finish the painting I have in process. I'm sure my family will be breathing a collective sigh of relief. Grin. The Tomato people were a way of me working on gathering the feeling of a folk art portrait without faithfully copying an old one. I knew if I tried to paint people first that I would get all tight and perfectionistic with it and they would have no soul. Hence Tomato People. I think I'm going to try to do a few people portraits now. We'll see. 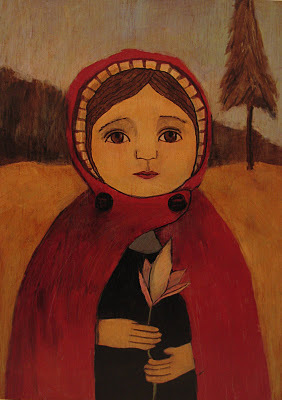 I did a Red Riding Hood painting that Denise of WildThread Studios purchased - you can see it above. I feel that I'm growing in my painting - I used to paint somewhat differently and once I get through this stage of exploration I'm hoping to see a synthesis from the brushy way I used to paint and the flat explorations of folk art portraits. Your painting is DIVINE!!!! I want more more more!!! Everyone who walks through my home and appreciates Art is drawn to both of the paintings I own from you. Keep on painting my dear! You will reap the benefits and be famous!!! She's sitting proudly on our mantel. A serene woman child who looks upon the happenings in our home with a quiet wisdom (although I do notice she gets a certain annoyed look when the husband person watches those action movies that are short on character develpement). This is one piece I will treasure always.